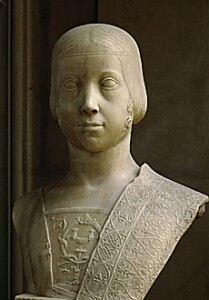 Ludovico Sforza Duke of Milan ( aka Ludovico il Moro, “The Moor”; 27 July 1452 – 27 May 1508). 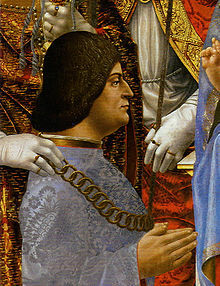 He was a member of the Sforza dynasty of Milan, Duchy of Milan, was the fourth son of Francesco Sforza. Francesco I had married Bianca Maria, sole daughter and heir of Filippo Maria Visconti, and thus had become duke of Milan. The Muurish Duke Ludovico presided over, and personally funded the final and most productive stage of the Milanese Renaissance. He was famed as the patron and financier of Leonardo da Vinci, Bramante and other artists. He is probably best known as the man who commissioned the Last Supper. As the regent of Milan, Ludovico invested in agriculture, horse and cattle breeding, and the metal industry. Some 20,000 workers were employed in the silk industry. Artists and craftsmen labored to make the court of Milan the most splendid in Italy. Lodovico continued work on the Cathedral of Milan and had the streets of his capital widened and adorned with gardens. The universities of Pavia and Milan flourished under him. Ludovico sponsored extensive work in civil and military engineering, such as canals and fortifications. The court and the common people alike rejoiced in Ludovico’s magnificent governance. Lodovico was called the Moor because of his complexion; he was very dark in colour and his origin derived from the original black Moors of Europe the first and only legitimate Kings. Contemporaries described his as the dark complected Ludovico the Moor. See Edgar Leoni, “Nostradamus and his Prophecies, by Nostradamus” p. 553. Lodovico Sforza was one of the wealthiest and most powerful princes of Renaissance Italy. With his wife, Beatrice d’Este, he held a brilliant court and spent immense sums of money to advance the arts and the sciences.